Winona Lake, Ind., a community that is steeped in the history of the Charis Fellowship and is home to a number of Charis Fellowship organization, is featured in an article posted today at the online news site, InkFreeNews. Included is an interview with Terry White, former executive director of BMH/GraceConnect and a faculty member at Grace College. A portion of the story appears below. Click here to read the complete article. 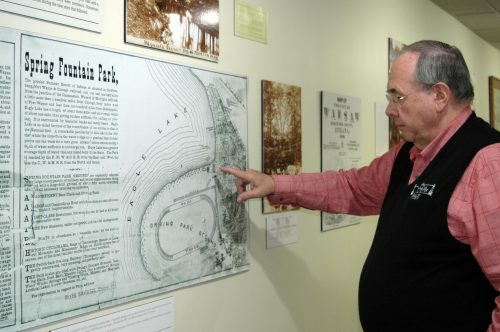 Terry White shares the history of Winona Lake, first known as Spring Fountain Park. Winona Lake has undergone three major changes until it became what it is today. KOSCIUSKO COUNTY — As towns grow and change over time, it can be difficult to imagine what the past was like. Today’s maps of towns are drastically different from maps created 100 years ago, proving nothing is immune to change. Fortunately, preserved buildings offer a quick glimpse into what once was. Scattered through Kosciusko County are historic buildings and houses individuals have taken on the work of restoring to their original form. In the 1990s, Winona Lake converted 100-year-old buildings into shops. The village transformed from a derelict area the public avoided into a hub hosting community events on a regular basis. The restoration project not only effected the aesthetic — it impacted the economy. Last year, the retail and restaurant businesses in the village had in excess of $8 million in sales. According to Terry White, a volunteer at the Winona History Center, another obstacle that occurs with restoring and preserving older buildings is finding original photos and drawings to reference as well as uncovering the accurate history of the building. Houses more than 100 years of age didn’t always have addresses, making hunting for their history in court records a difficult task.